We were looking through some old photos, one of which was baby Eilene holding half a naan that was bigger than her head. Eilene asked, why I have not made them in years. She then asked for shashlik and naan for Sunday’s dinner. Five years ago, I posted a recipe for Uyghar naan. Since that time, I have learned some new techniques in bread making and I decided to use them in making this Central Asian bread. Note: I have discovered that cold proofing bread dough for a day or two produces a much more complexly flavored bread. Naan (nan, non, n’n, neng) means bread and usually refers to a leavened flat bread. There is a wide assortment of breads that go by that name. Some are small (Afgan), some are snowshoe shaped (Indian), and some are not even very flat at all (Tajik). 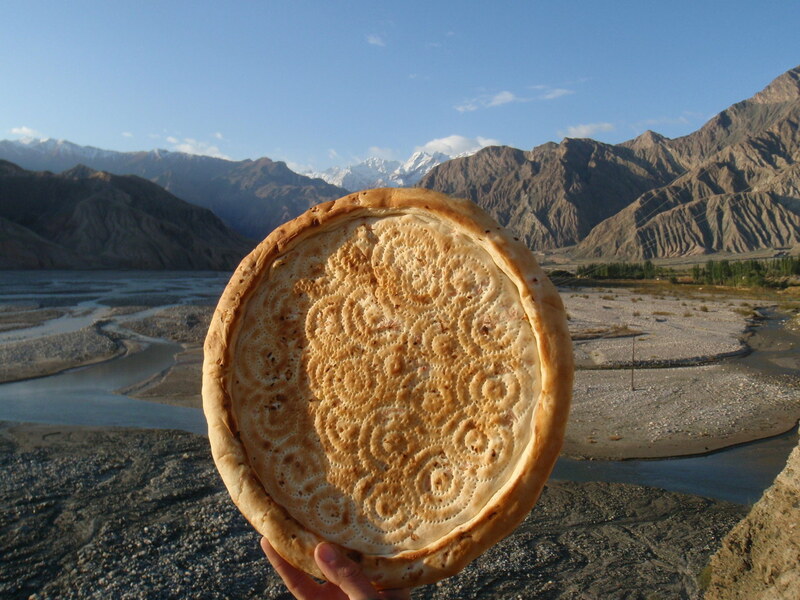 In Xinjiang, the naan are big, round and flat in the middle. This bread was the most available, the safest thing to eat on the street and also the tastiest. We ate this bread every day, while we were traveling through the far west of China. Note: In addition to the bread dough you need several other items. You will need: 1) a sprits bottle of water, 2) a baking stone, 3) a peel (I use thin flat steel cookies sheets), 4) a bread stamp of some kind, 5) a 500° F oven, and 6) the courage the stick your hand into a blazing hot oven—the slightest brush against the rack or sides of the oven will give you an instant 2nd degree burn. Each baker then further marks his bread with his personal combination of toppings. Cumin, garlic, green onion, nigella (black cumin), poppy seeds and salt are common elements. Each baker’s bread is different from the next. The thing they have in common is being fresh, hot (if you get there early) and delicious. Note: In Kashgar, the bakers use a 2-4 inch round hand stamp with pegs arraigned in a family pattern. When baked in a super hot oven, the edge comes out bready, but the middle is more like a cracker. Note: Start making your dough a day—or three—before you plan to bake your bread. 1. Dissolve the yeast in ½ cup of lukewarm water in your bread bowl and add a pinch of sugar. 2. When the yeast is foaming well—about 10-20 minutes—add 2 more cups of warm water. Tip: Be sure that the water is not too warm or it will kill your yeast. 3. Add 3 cups of bread flour and stir in one direction until the gluten has developed. Some say 100 strokes, this is way too mechanical for me. I have been making bread since I was ten. The indicator for me is when your stirring spoon starts to create large bubbles that stretch elastically a bit before they pop. 4. Let this “sponge” rest for 30 minutes. Tip: Salt inhibits both yeast growth and gluten formation. By giving these processes a head start on their own, with plenty of water and flour, you can produce a beater bread. Note: One of the disadvantages of adding the salt later is in that it is difficult to get it to blend evenly throughout the dough. Adding the salt to a very wet sponge makes it easier to mix the salt into the dough. 5. Mix the salt into 1½ cups of flour. Tip: Sifting the salt and flour several times produces a very through mixing. 6. Mix the salty flour into the dough, until it is mostly absorbed in the dough. Tip: It is OK for there to be floury lumps at this point. 7. Put about ½ a cup of flour on your bread board and spread it about a bit. Tip: A bread board is any clean flat, nonporous surface. A wide wooden board would work, but a tiled counter top with grout cracks is a definite no-no. I use a pastry marble. 8. Scrape all of the dough onto the floured board and knead the dough for at least ten minutes. Tip: Add more flour as necessary to keep your hands from sticking, but do not use more than is necessary. Note: Take the palm of your hand and lay it on the dough ball. Press down and away from you—this is called kneading. Pick up the far edge and pull it back over the dough. Rotate the dough 90 degrees and repeat. As you knead the dough all of the dry lumps will be worked out of the dough and eventually it will start to feel elastic. Only experience will tell you when the dough is ready, but until then use the ten minute rule. Tip: A dough ball is a mass of gluten sheets. When you cut dough—with a sharp edge—it is like taking a pair of scissors to cloth and cutting every which way across the weave. When you pinch the dough it is like tearing a piece of cloth along the weave. This keeps most of the gluten sheets intact. Note: This is where I have seriously deviated from my original recipe. If you are in a hurry and wish to bake these into naan in one day: Return the dough to the bowl, cover it with a clean damp towel, and let it rise for 1½ to 2 hours until it has doubled in size. Punch the dough down and then divide it into four pieces. 10. Roll each of the halves into cylinders and divide the dough into four equal quarters. 11. Rub some vegetable oil on your palms and handle each dough ball to cover them with the oil. 12. Place each ball into a separate seal-able quart plastic bag. 13. Place the bags of dough in the refrigerator for at least one day—and up to five days. Note: The low temperature of the refrigerator inhibits the growth of bacteria which would generate lactic acid—the sour in sauerkraut—and other “off-tasting” flavor compounds. 14. Put the baking stone on the lowest rack of your oven and start preheating to 500° F.
Tip: If you have two pizza stones you may put the second one on the rack above the first stone. This essentially turns a regular Western oven into a close approximation of a Central Asian beehive oven. 15. Roll and stretch the dough balls on a floured board. Tip: Take a ball and flatten it into a thick disk about 5 inches around. Use a rolling pin to flatten it into a thinner disk about 7 inches in diameter. The dough will want to shrink back, because the gluten acts like a rubber band. Let one disk rest while you work with one of the other balls. This will give the gluten time to relax and it will be easier to stretch it further on the next try. Continue rolling and resting the dough until all the dough are 12 inch disks—towards the end of this process you may use a pizza toss if you are comfortable with it. Cover them with a dry towel. 16. Sprinkle a teaspoon of semolina/corn meal on a cookie sheet. Tip: I have three modern—read multi-layered and thick—cookie sheets that I use as peels to raise my dough on before putting them in the oven. I also have an old cookie sheet—that is basically a single, thin sheet of steel—that I use to remove them when they are finished baking. Note: The semolina/corn meal help keeps the dough from sticking to the tray when you try to slide it into the hot oven. 17. Transfer the one of the dough rounds to the prepared cookie sheet. Tip: The disks of raw dough are very “floppy” and the easiest way to move them is to roll the dough onto a large rolling pin and unrolling it onto the prepared cookie sheet. Tip: It is easiest to work with 2-3 cookie sheets at a time and have a second loaf rising and ready for the oven as soon as the first is done. 19. Prick the middle of the disk evenly up to 1½ to 2 inch of the edge. Tip: This is where the bread stamp comes in handy—this is very hard to do with just a fork, but it can be done. I have found a 2 inch round pinned block designed for ikebana that works quite well. 20. Spritz water lightly over the center of the dough. 21. Sprinkle a good scattering of the green onions, black cumin and salt over the dough. Tip: You may use any herbs or spices that you wish to make this naan your own. 22. Slide the dough off the cookie sheet onto the baking stone. Tip: Shake the cookie sheet—before opening the oven—to make sure that there are no “sticky spots. If there are, use a pancake turner and a bit more flour to ensure the dough disk slides easily onto the pizza stone. WARNING: The oven is now at 500°F and that is extremely hot. The slightest brush against any of the metal surfaces, the rack, the edges of the oven, will give you an instant second degree burn. Be extremely cautious when putting the bread into and taking it out of the oven. 23. Bake until the top is well browned. Tip: Check the naan after three minutes of baking. Use a fork to “pop” any large bubbles that have formed at the edges. If you do not do this the tops of the bubbles will burn before the loaf is finished baking. 24. Use a peel (or flat cookie sheet) to remove the finished loafs and let them cool on a wire rack. 25. Stack the naan and wrap them in a towel until you are ready to serve them.